This East Hill Ranch has tremendous character with beautiful detail and windows that drench the living space with sun. 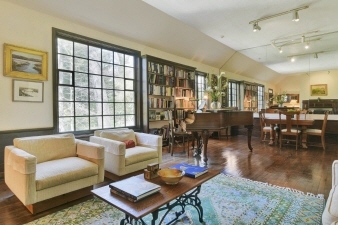 The spacious Living Room/Dining Room boasts beautiful woodwork, built- in bookshelves & a wood-burning fireplace. The large Eat-in-Kitchen, Master Bedroom & Bath, 2nd Bedroom & Full Bathroom complete the main floor. Lower level has a third bedroom option/guest suite with recreation space, full bathroom, laundry room & great storage, including a cedar closet & utility room. The outdoor patio is perfect for grilling or just enjoying the private setting currently in bloom. This well maintained home is in close proximity to downtown shops, schools, parks & NYC transportation. Additional features include 2 car garage, high ceilings, hardwood floors, whole house in-ground generator, underground sprinklers, alarm system, central air & gas heat. Tenafly has Award Winning Schools and is just minutes to NYC. It is a Must See!